DREDGING BEGINS: January 15, 2014 - The rumbling and clanging of the staging at Marina Park (parking lot) has begun and the floating platform is in the harbour! IT'S OVER: March 26, 2014 - Work is completed on the dredging of the harbour. The contractor will be removing the barge and equipment off site over the next week or so. 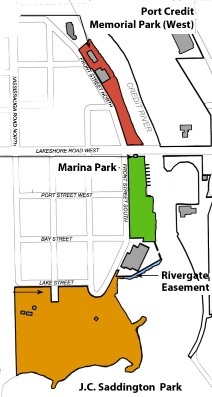 The City has advised they have achieved the goal of deepening the harbour (2M) to accommodate motor craft so that the marina will open when the season begins in mid-May. HARBOUR DREDGING - OPEN HOUSE: October 29, 2013 at PORT CREDIT ARENA. ► Click for OPEN HOUSE NOTICE (October 1, 2013) explaining the process. 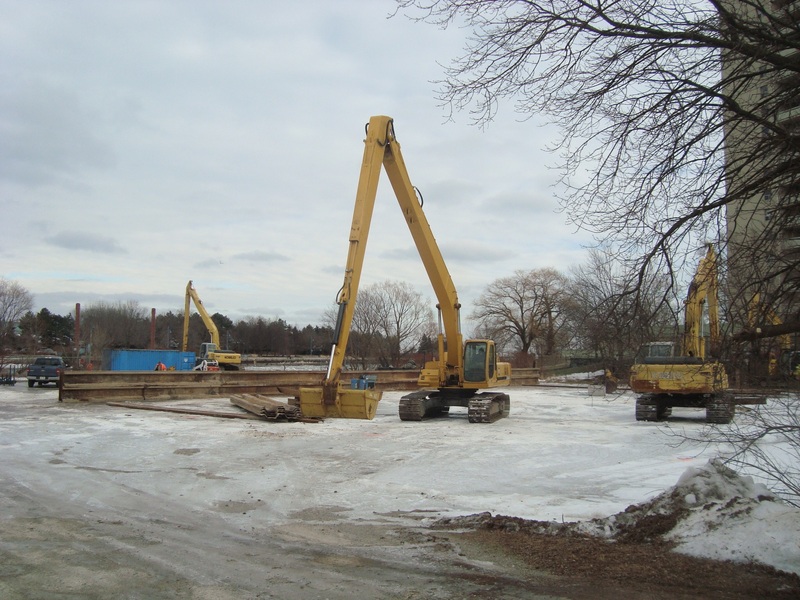 NOTE: At the Open House we learned that the dredging will take place between mid-January and March 2014 as the cold weather minimizes the odour from the dredged material. ► Click to view the DISPLAY BOARDS (5p PDF / handout) shown at the Open House. 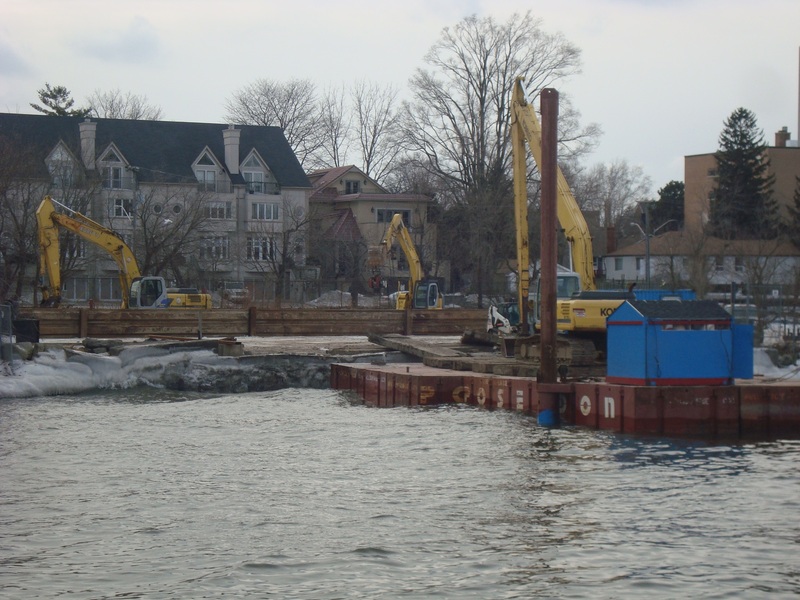 DREDGING APPROVED: February 13, 2013 - General Committee of Council approved emergency dredging of the Port Credit Harbour for Fall 2013. Water levels are way down (approx. 2-3') in the PC Harbour, per this photo taken January 2013. PC is a deep water port, but right now signs are posted otherwise. Dredging was due in 2010 but deferred. 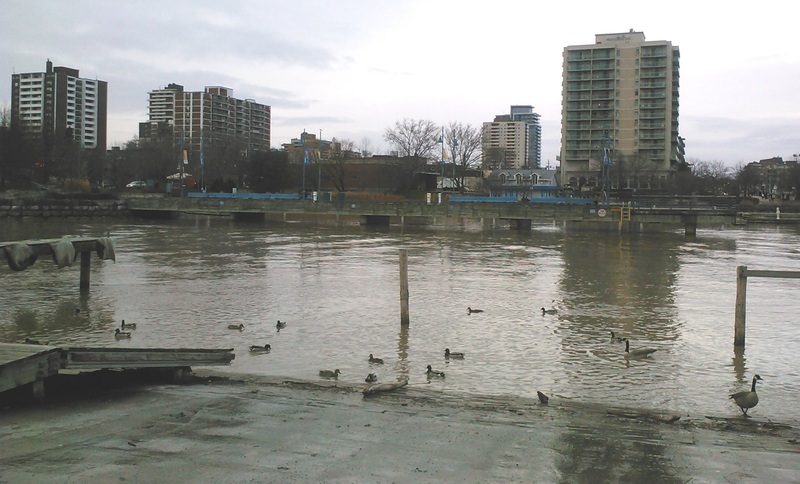 Significant Credit River silting (from stormwater runoff in the north of the City) and low Lake Ontario levels (a record hot dry summer in 2012 and low snowfall this winter and last), means some boats in the harbour may be close to dragging bottom this year. ► Click for the City's Corporate Report: Feb. 1, 2013 (6p PDF). Excerpt: "Dredging to a depth of 1.2 m (4 ft) in three areas of the harbour basin will return the water depth to navigable operations for recreational boaters and charter operators." Port Credit Harbour is a popular destination for recreation, boating and fishing, providing a positive quality experience and economic benefit in the City. 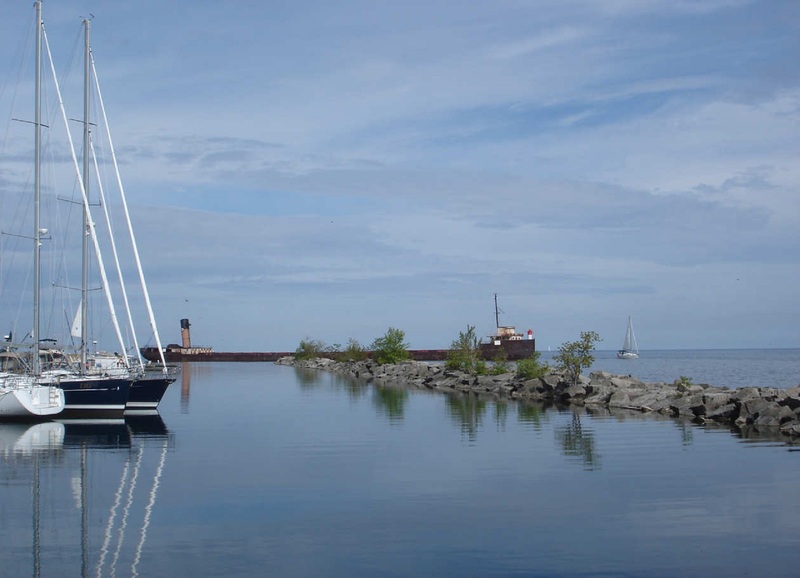 In recent years, low water levels in Lake Ontario and sediment accumulation at the mouth of the Credit River have challenged boating operations in the Port Credit Harbour. 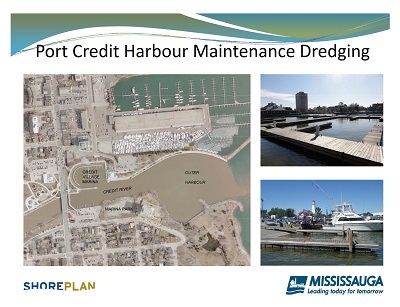 In order to ensure continued use by recreational boaters and charter operators, the City of Mississauga plans to dredge part of the harbour to a depth of 1.2 m (4 ft.) in the fall of 2013, once all the necessary agency approvals are obtained. Further public notification regarding the plan to dredge the Port Credit Harbour will be provided prior to the works being undertaken.